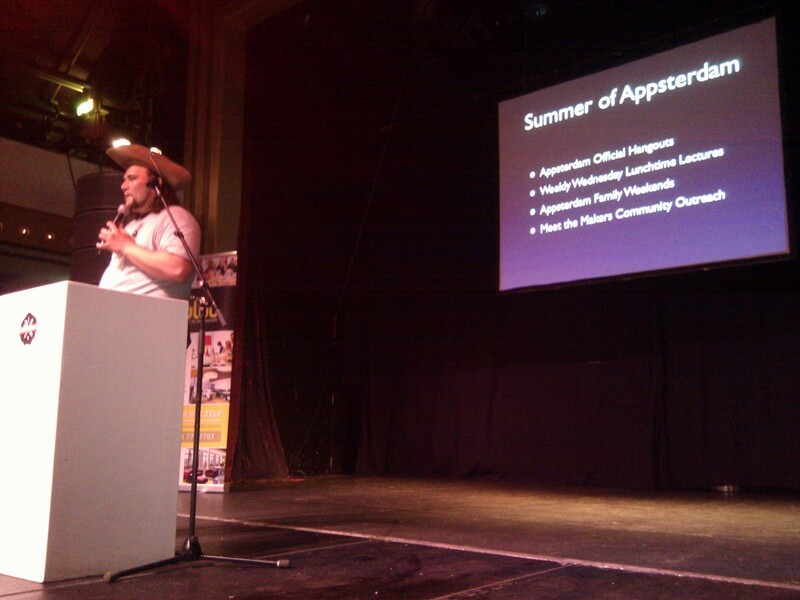 Yesterday Mike Lee (@bmf) kicked off the Appsterdam movement in a big room full of passionate developers in Amsterdam. He spoke of his dream, to make Amsterdam the central innovation hub for App Developers. Unlike in Silicon Valley, Amsterdam and its surrounding countries in Europe has a unique pool of design and developer talent that is still waiting to be explored. Silicon Valley has the name, a great infrastructure, enough cash to fund anything that needs funding, talented people. In many ways however, it is becoming a closed system. It’s hard for outsiders to move over there and work, get healthcare, be part of the startup scene, get funded. With Appsterdam Mike is starting a movement that will attract many talented developers to the city to work on cool stuff. Not only does Appsterdam offer you help with getting to Amsterdam, but it will suggestions to stay, lists of companies looking for devs, places to hang out and work together and get inspired. It will also, as Mike announced yesterday with Floris van Alkemade from Solid Ventures, have its own investment fund called the Appsterfund. The Appsterfund isn’t just a fund with money to invest. It is a group of investors that help developers with business plans, coaching, and with a huge network to investment companies in the Netherlands, Europe, and Silicon Valley of course. Appsterdam isn’t a company, it isn’t a group of people getting paid to do their jobs. It’s a movement. We all are Appsterdam, and that begs the question, what can you do to help Appsterdam? Well, for one, you can get over here for summer and become part of the Appsterdam summer program (see the site or twitter for more details). Hang out with devs, work on cool ideas, get to know Amsterdam, and decide if you want to work here for a while. Given that each of us has it’s own talents, there are certainly other things you can do. Become a member today, contact the Appsterdam movement and start helping out. That’s all there is to it. What am I going to do you ask? A good question! Yesterday I got to be on stage as well and I announced the launch of the Appsterdam Zwapp channel. I call upon all developers to get into contact with me to become part of that channel. I have written a separate blog post about the Appsterdam Zwapp channel here, which explains in more detail how this can help developers to promote their apps and get into contact with the Zwapp passionate app lover community. Lets make Amsterdam the best App Developing capital in the world together. Go Appsterdam!! follow me on twitter, or email. This entry was posted in Uncategorized and tagged App Devvelopers, Appsterdam, Appsterdam Zwapp Channel, Mike Lee, movement, Zwapp. Bookmark the permalink.